Isn’t it funny how when moms of young children get together, all they do is talk about children? One of the most popular topics, I’ve found, is food. “My child won’t eat vegetables” or “My child eats anything” or “My child won’t eat anything but sausages” or even “My child won’t eat anything at all!”! You really do hear it all. Sometimes the question of what to put in their child’s lunch box comes up, as the every-day Vegemite sandwich and apple can get pretty boring. I try to recall all I’ve read in kids’ issues of Donna Hay magazines to give some advice – pizza muffins, chicken wraps, frittatas, potato salad. I’ve tried a lot of things with my own kids, but they always end up wanting Vegemite or ham and cheese sandwiches (yes, my kids are pretty boring when it comes to food!). My daughter is the most adventurous. She’ll give up her Vegemite sandwich for a tuna, corn and mayonnaise sandwich on occasion. My 5-year-old son though, he wouldn’t give up his ham and cheese sandwich for anything. 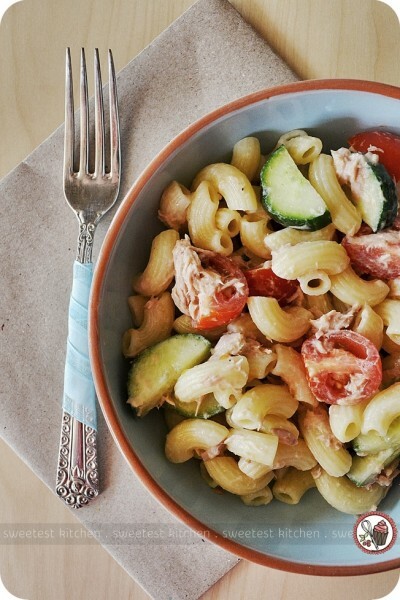 One of the most successful of Donna Hay’s lunch box recipes for children, in our experience, was a tuna pasta salad. It is the easiest sort of recipe you can imagine. In fact, your child could basically prepare this recipe for themselves, except for perhaps cooking the pasta. Just to prove this point, I asked my 7-year-old to make it herself, while I cooked the pasta. 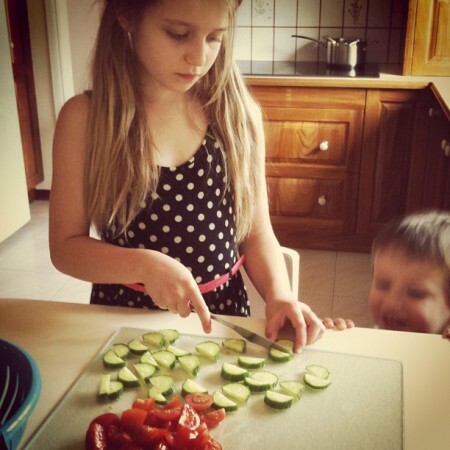 All she had to do was slice a few cherry tomatoes and a cucumber (we usually use Lebanese cucumbers). Then whisk together some mayonnaise, lemon juice and seasoning. Once the pasta was cooked, she stirred everything together with a can of tuna. And she was done! She did a brilliant job and it tasted fantastic. She loves this in her lunchbox alongside her sandwich. It adds a bit of freshness to her lunch, which she enjoys. You can use any type of pasta you like; we usually prefer the spiral kind, but we use whatever we have in the pantry. In the case above, we used elbow macaroni. This pasta salad is super easy and delicious, making a perfect addition to any lunchbox or meal, especially when you don’t want to do a lot of cooking. It would be excellent for a picnic, as well. Just a side note: if you wish to include this in your or your child’s lunchbox, be sure to include an ice pack if refrigeration is unavailable. 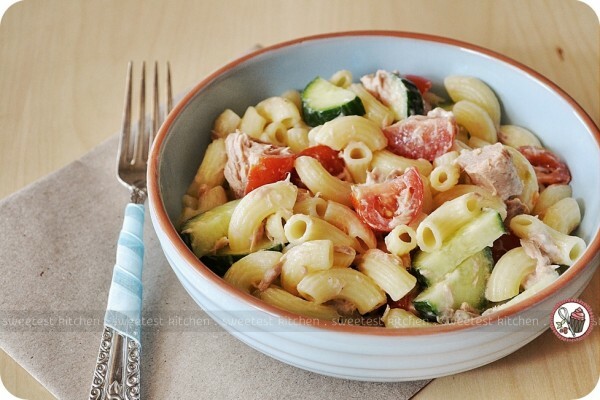 Eat the pasta salad as soon as possible, and don’t eat any leftovers from your lunchbox. Although I doubt you’d have any leftovers! 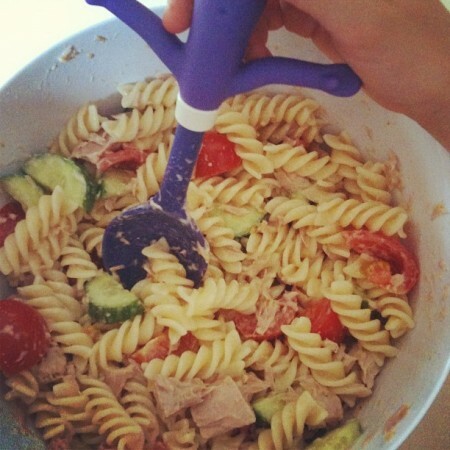 A quick and easy fresh pasta salad perfect for kids, lunchboxes, picnics and side dishes. Cook the pasta in salted boiling water, according to package instructions. Drain and allow to cool. Whisk together the mayonnaise, lemon juice and seasonings in a small bowl until combined. 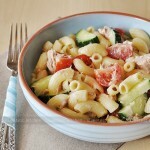 Place pasta, tuna, tomatoes, cucumber and mayonnaise mixture in a large bowl and toss/stir gently to coat. This is a great dish! Sounds good for kids. It’s healthy and delicious!